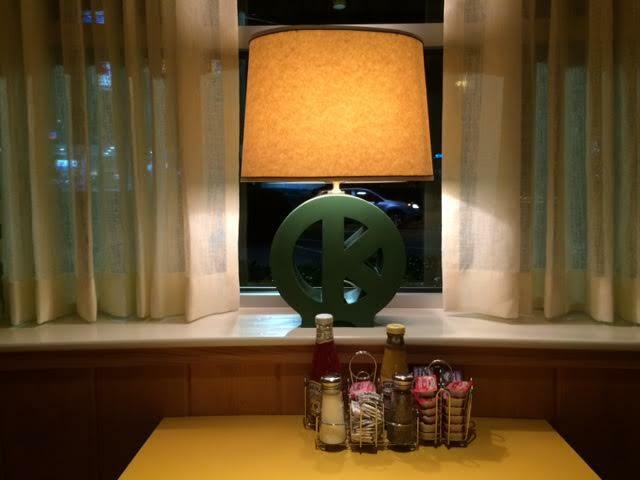 The wait is over, OK Cafe is NOW OPEN! OK Cafe, the popular southern eatery that closed last December due to a fire, reopened for breakfast today. The restaurant, located in an outparcel of West Paces Ferry Shopping Center near Northside Drive and I-75, has been a neighborhood landmark since its opening in 1987. OK Cafe and its classic southern fare and blue plate specials are popular for business meetings and power lunches with the area's business and political movers and shakers and was sorely missed during its nearly year long absence. I spoke to co-owner Susan DeRose at a private friends and family "mock seating" over the weekend about the reopening process. The only thing they were able to save fully was the giant tree with money as leaves in the main dining room. 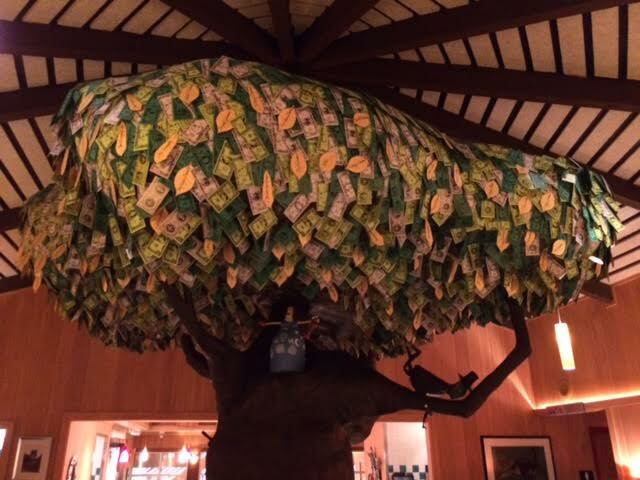 DeRose said the tree is a reference to her mother telling her as a child that "money doesn't grow on trees." The one addition to the tree is additional yellow leaves which have names of donors and patrons who assisted the restaurant's employees during OK's closure. OK Cafe is one third of Atlanta-based Liberty House Restaurant Corporation which also includes Blue Ridge Grill and Bones. Elsewhere in metro Atlanta, a LongHorn Steakhouse near Toco Hills that also caught fire months before OK Cafe will also be reopening, but much later. With the former restaurant now demolished, a representative from LongHorn indicated that the new restaurant should be open by next summer. being a buckhead native transplanted to CA twenty years ago, i was shocked to see that flag so prominently displayed. best country fried steak, squash casserole, fried okra and sweet tea. best of luck! The city of Atlanta needs to get their permitting/code enforcement/planning department in order. It shouldn't have taken a year to get the OK Cafe to open again but thanks to the red tape involved with dealing with the city of Atlanta government bureaucratic nightmare, I'm betting the OK Cafe was going in circles for many months dealing with these incompetents. No wonder no business wants to locate in the city. That flag is embarrassing to most Atlantans. I'm done eating there until it goes away. 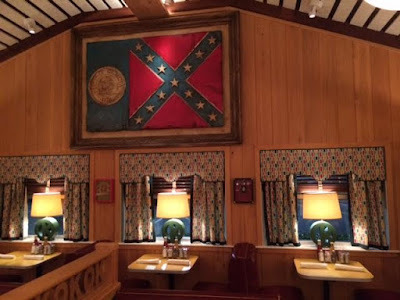 Never eating here until they take that stupid flag down. Thanks - it'll allow me to get a table a few minutes earlier! Dealing with Atlanta's Office of Buildings (zoning and permits) is an absolute nightmare. I'd say 15% of opening costs are due to the Office of Buildings' permit delays. Not only are businesses losing money, but so is the city due to this departments inefficiency. This issue must be addressed asap. To those who are so offended by the sight of the historical (i.e., our previous) Georgia state flag, I suggest that you cast your gaze elsewhere. It's amazing how politically correct we've all become. Those of you who are offended at a piece of history should definitely stay away! Also, you should avoid museums, history books, and documentaries, but I'm guessing you're already doing that! OK Café is a more than a bit overpriced for what it is, and I don't go there often, but I'm glad to know that it's back in business after a long absence. Agree with the previous poster. History is full of errors. How else will we learn? I suppose these same "offended" breakfast-eaters will never patronize the Atlanta History Center right up West Paces Ferry Road? If there were a picture of our solar system with Pluto shown as our 9th planet would you be so indignant? We live and learn. Most people I know go to restaurants for the food and service, not the "artwork". Don't worry OK Café, we'll be by to eat very soon. Good luck! The people who are defending the flag are obviously white. I'm not mad, as a matter fact I'm quite happy that ignorant, callous, racist people are still ignorant enough to voice and show their true colors, thank you - it's a constant reminder that 400 years after white people enslaved Africans that we are still not accepted in this country. The word Racist has lost its meaning thanks to ignorant people like Anonymous on October 17, 2015 at 3:11 PM. Is the southern cuisine or "soul food" served at this restaurant a painful reminder of enslaved Africans as well? Food for thought. I never knew OK Cafe doesn't accept African people. Glad to see they are back up and running. Long time coming. I'm fine with the flag being displayed. Actually, kudos to them for doing it. It's not a hate symbol but a historical one. Funny that no one cared about the flag until some teenage idiot had it in a picture and did a crime. Time to jump off of the "everything is racist and pour on the guilt over something that happened in the past" bandwagon. If you don't like it, tough. Go somewhere else. I think the restaurant will be OK without your judging rear ends.